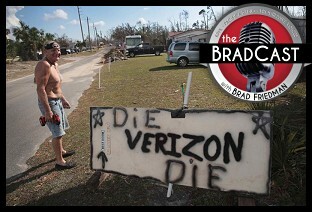 " GOP Telecom Deregulation Haunts FL Panhandle Recovery After Michael: 'BradCast' 10/22/2018	"
First up today, an update on the latest in the alleged Saudi murder of Washington Post journalist Jamal Khashoggi and the wildly unreported fact that he had "self-exiled" from Saudi Arabia after being banned by the Saudis from writing and appearing on television or at conferences back in December of 2016 --- for being critical of then President-elect Donald Trump! That point seems quite important, given the Trump Administration's continuing efforts to help cover up the assassination in coordination with the Saudis and their ruling Crown Prince Mohammed Bin Salman, after they repeatedly lied about the grisly killing of a journalist who had been mildly critical of Trump, as first reported in late 2016 and by the U.S. State Department in 2017. Next, GOP voter suppression continues across many states in advance of the crucial November 6th midterms. Over the weekend on Twitter, President Trump lauded Georgia's Republican Gubernatorial candidate Brian Kemp, who as Secretary of State, has been working for years to suppress tens and even hundreds of thousands of disproportionately African-American voters in the Peach State. Kemp, as the state's chief election official, is overseeing his own election in a reportedly tight race for Governor against African-American Democratic candidate Stacey Abrams. Trump also took the opportunity on Twitter over the weekend to falsely fan the flames of the GOP's phony claims of "VOTER FRAUD" in hopes, according to the Lawyer's Committee for Civil Rights Under the Law, of inciting government officials and law enforcement to intimidate minority voters before the crucial November 6 election. The Lawyer's Committee heads up the 866-OUR-VOTE hotline to answer question and help trouble-shoot voting problems, such as recent reports that early voters are being either turned away or forced to vote by provisional ballot --- rather than normal ones --- if the address on their ID does not match the one under which they are registered. Georgia's Photo ID voting restriction does not require registration addressees to match those on IDs (e.g. student voters who may not have in-state driver licenses or those who recently moved but have not yet updated their license.) Please contact the 866-OUR-VOTE hotline with questions about local voting laws or any problems at the polls --- and share that number far and wide over the next two weeks! Finally, despite national media now focusing elsewhere, the devastation in Florida's Panhandle following the Category 4 Hurricane Michael two weeks ago continues and the official death toll is still rising. At the same time, power and phone service is still out in a number of rural areas, thanks in no small part to the deregulation of telecommunications company rules by Florida's Republican Gov. Rick Scott shortly after taking office in 2011, and by Donald Trump's FCC Chairman Ajit Pai. We're joined today by Public Knowledge's Senior Vice President HAROLD FELD, who has been warning for years about exactly such a situation. Feld explains how Scott gutted almost all of Florida's telecom company rules when he signed the "Regulatory Reform Act of 2011" and how Pai went still further when he gutted Obama-era phone company regulations in November of 2017. Scott's 2011 measure "was a complete deregulation of the telephone industry in Florida. It removed the state Public Service Commission from any sort of jurisdiction over residential telephone service. It removed something called 'Carrier of Last Resort,' which means there always has to be a telephone provider in the area. It even removed the ability of the Public Service Commission to take complaints from consumers," Feld tells me. He describes it as "one of the most radical deregulations in the country." As to the federal regulations scrapped by Trump's FCC, that was in response to federal regulations enacted in the wake of the disastrous performance by Verizon following SuperStorm Sandy in 2012, when copper lines were swept away, and phone companies failed to restore them, claiming that the use of cell phones meant they were no longer necessary. Obama's FCC insisted that "no repairing was not an option," says Feld. But Pai "insisted that there was no reason for any of these regulations [and] that companies have private incentive to deploy these networks, despite everything that actually happened," particularly in rural areas, following Sandy. The Government, he notes, largely for decades has recognized "that it's always going to be profitable [to ensure service] in the cities, [but] it's not going to be profitable once you get out into the rural areas." So, it's been a value and tradition "through each upgrade of our communication network --- when we went from letters to the telegraph, from the telegraph to the telephone" to ensure service to all. But that's no longer the case. Like Gov. Scott's Florida, Feld describes, some 37 states have lifted similar decades-old telecommunications requirements, thanks to legislation encouraged by the American Legislative Exchange Council (ALEC), a privately-funded partnership between major corporations and (mostly) Republican state lawmakers. « PREVIOUS STORY "Legal Setback for Besty DeVos, Conflicted 'Queen of Debt', Is Good News for Defrauded Students"